The Title of Fiona Talbot & Sudakshina Bhattacharjee’s book Improve Your Global Business English immediately caught my attention as I wandered through the digital halls of Amazon’s bookstore. Global Business English? One of my favorite topics. What really sparked my interest however was the fact that the book was also written for a Native Speaker audience. I decided to make an order and see what the book was all about. A focus on written skills dominates the book and is where its strengths are found – a lot of useful information is given in terms of creating clear international messages that are both powerful and effective while being culturally aware. Many tips are given. The following topics are discussed in detail: the writing of emails, reports, agendas, notes, minutes, internal messages, marketing materials, and online communication. The authors do a good job explaining many of the key points in how to write these documents in a globally clear manner. 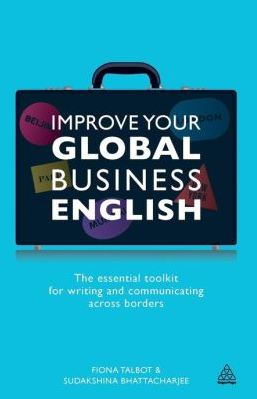 The book would be particular interesting for a small business owner or for a company wishing to implement an in-house style guide for global written communication. As I read each section I often felt as though this book should be handed over to decision makers in the Human Resource or Company Training Departments… many examples spoke to the reader as if they were responsible for company wide marketing campaigns or in a managerial position. This advice definitely hit the target. “It can be good to have a global business English style champion” in the department/company. This got me thinking about departmental Global English champions: An expert in the department that could be the go to person with questions regarding Global English. Would such an expert be valuable for a company? Could one train up an employee to become a Global English champion? I couldn’t agree more with these comments! The amount of money that is lost on a daily basis from miscommunication is astounding… but just how much of that is due to being unaware of language and unable/unwilling to adapt to a more global style? I believe quite a lot. The first image that came into my mind was an American businessman giving a presentation full of phrasal verbs, idioms, and colorful cultural references to a Chinese audience. Might that businessman lose out on a contract simply because he could not communicate clearly, which led to silent stares, fake smiles, and a clear avoidance of asking clarifying questions in order to keep face? I imagine it’s happening somewhere in the world as I write this…I couldn’t agree more with these comments! Avoiding jargon is another key aspect of communicating clearly internationally. The authors of this book wisely mention this quite a few times. “… go for a middle path. Develop a style that edits down to the main points (cutting out waffle) but also includes enough information, so every message is entire and meaningful. It’s crucial you do this”.